Do you know what this house is or where it is located? It was built in the 1920s, in Cleveland, and is notable for the building material used. 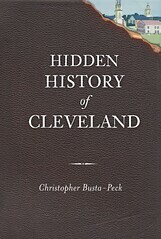 If you are unable to comment here, please email clevelandareahistory@gmail.com with your answer. Entries will be judged based on their time stamp. I have no idea, but it looks like a 1920s house (or it was remoedlled to look like a 1920s style house) with the side facing the street and the front to the driveway, Something you find in Columbus a great deal. I do love the hood over the door, though. is it the North Collinwood or Neff Rd. area? 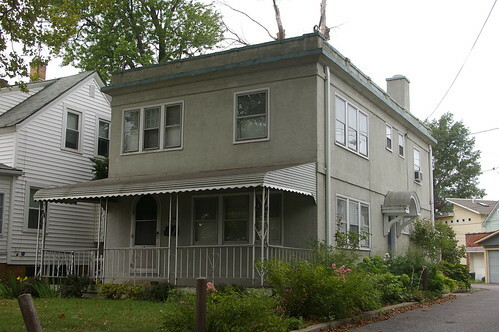 Built of concrete; in the Cleveland Heights area? I might have been clearer in my update / hint - the house is in the city of Cleveland. East 156th north of Lake Shore Blvd. We have a winner! The Humphrey-Meister Concrete House was built in 1922. The house, a Cleveland Landmark is located at 128 East 156th Street, Cleveland, Ohio. I don't have any more information at the moment - it's something that I've been meaning to look into. As Cleveland Landmarks go, I thought it was distinctly different. the person who owns the house is/was one of the architects working on the Cleveland Museum of Art - Vinoly team.